First, before I even introduce myself I would like to say how honored I am to have been asked to join the team on https://kidsaintcheap.com/. Being a mom to four great kids always has me looking for ways to save money and get great reviews on products I am looking into buying. My name is Deb (age 40ish) and I am a wife and mother. My husband works more than full time and I work full time from my home office as a writer. My writing consists of medical, financial, family as well as anything else that may catch my fancy at the moment. I have four biological children, (three boys and one girl) ranging in ages 20-10 yrs. (wow, how time flies). Two are in college, one in middle school and the youngest in elementary school. My days are always busy, hectic and full of trying to invent ways to multitask more than I already do. I cannot say my life is boring in any way, shape or form. And I have to admit my house is too quiet when my kids are at school. I love to write and always have from the time I was in middle school. Before deciding on writing full time a few years back I worked in the medical field. My days were 12 hours long and I missed my kids. My days off were spent trying to catch up on everything that I didn’t have time to do during the week. I felt like I was missing too much and exhausted all of the time. My youngest son (age 10) was an emergency delivery a month early. He immediately required open-heart surgery and was then diagnosed with Hirshsprungs Disease. Anyone that has a child with health issues will be able to understand when I say not only is it one of the most emotional things a person can go through but it is also financially devastating. When your child is fighting for his/her life it’s amazing how we manage to make ends meet to get through. We lost pretty much everything including our family van. He is now doing wonderfully and keeping right up with life. What have I learned in having children? Money cannot ever replace them. I want to be with them as much as I can. If I am gone from home 12 hours a day I can give them all the toys and gadgets they want but that is not as important as the chance to be with them. I work as a writer to help the household income and I love what I do. I love being able to be with my kids and husband when needed. We don’t have luxury cars but we are comfortable and happy. I hope to be able to make a worthwhile contribution here and learn at the same time. I am extremely grateful to be given this opportunity to write on a site that helps families unite for resources and money saving tips. So now I am off. I have writing to do. In August of 2011 my beautiful daughter is getting married and I will then have another chapter to write and share. Have you ever had a child with a major health issue? Hello there! My name is Sarah Reidy and I am one of the Mom Bloggers that will be contributing to this great new website, kidsaintcheap.com. You may notice that some of my favorite topics to write about are: simple green tips you can use every day around the home and saving money while raising a family. I also like to review products every once in a while that either I or my children have used. If I like a product, green or otherwise, you will probably hear about it. If I don’t like something, you might hear about that too. You should also know that I have one husband, two children and two English Bulldogs. The dogs might not walk on two legs, but they are definitely part of the family! By the way, we adopted Bulldog #2 over the summer, and even though this might have been a socially-conscious thing to do, it has been no walk in the park (no pun intended). Advertised as the “perfect” five-year-old dog, Bulldog #2, otherwise known as “Pearl”, has turned out to be an almost eight-year-old with just a few teeth left and a bladder control problem. But, in the words of my wise daughter, “every dog deserves a good home”. Does this have to include toothless, incontinent dogs, too? I’ll have to keep you posted on that one. Do you have dogs? Do you consider them family? Hola! The time has come for me to introduce myself. After all, how can we talk to each other if you don’t know a thing about me, right? Let me start with the basics, all the stuff you can box into neat little categories. I am a single mom to a fun-loving, intelligent, caring 5-year old boy and a sensitive, smart, independent 3-year old girl. I am a trainer and quality manager by profession, but a lover of words, pictures, and notes all the minutes in a day. I do my best to keep as close to my loves as I can. Now for the part that isn’t neat and tidy. I am a progressive parent. What does that mean? Borrowing the title from a teaching approach, I take all things into consideration when parenting. I look at what tradition has always dictated but I study it to see the logic behind the lore. I look at new-fangled recommendations and see if these are not just fly-by-night suggestions or advice that have merit. I try to provide my children in teaching and in material things, what I think they will need to feed their souls and to live a happy and productive life. In line with this, any parenting advice I give will be in line with this effort. You will find some traditional ideas, some new ideas, and always an explanation of why I think such is so. I teach my kids how to be simple, how to find joy in creativity and imagination, how to be independent and productive and so my posts will often have these characteristics as well. I am not a child-care professional. I have no educational experience in early childhood education. But I am a dedicated mother who wants only the best that is possible for my kids. I think that lends me some degree of credibility. I hope my posts are fun and informative for all. Happy reading! What are your views on parenting? Hello! Allow me to introduce myself. My Name is Christie and I am a freelance writer from the beautiful Pacific NW. I am a mom to 3 year old fraternal twin boys. They are smart, sweet and have a lot of energy! They bring me oodles of joy and make me laugh every single day. I also have an amazing husband, who works hard for our family, which has allowed me to stay home to raise our boys and pursue my writing career. I love to cook! I’m not great at baking but I’m working on getting better at it. When our boys started eating solid foods I made it all from scratch; it was super simple and we saved a lot of money! I have always tried to eat healthy but it became even more important to my husband and me, after we had the boys. I have been a volunteer for the American’s Cancer Society’s Relay for Life for several years. After we had the boys, my efforts were limited to helping put out a newsletter every once in a while. This year however, I am the online committee chair and really excited about helping out in a bigger way. I have lost many loved ones to cancer and know a lot of survivors; so it’s important for me – to donate my time – to help find a cure. I never even dreamed that I would have twins but I am so thankful that’s how things worked out! My husband and I always said we wanted two kids, and we got them in one shot. No, we aren’t having anymore (people always ask us this) but I did enjoy being pregnant – 3 months of bed rest and all. I have always wanted to be an at-home Mom. I imagined that being home with my children each day; to see all of their “firsts”, to teach them about the world, and take them to fun and educational places, would be the best thing ever – and it is! Oh sure, there are days when I long for the quiet and serenity of going to an office, but I know that if I were there, I’d just be thinking of how much I would want to be here. When things get a little hectic – and they usually do – I take a deep breath and try to keep in mind that this won’t last forever and I need to enjoy these moments now. Before long, we’ll be helping to pack up the boys’ cars, as we send them off to college and I’ll be left longing for these wonderful, magical, crazy days, once again. Some of the subjects I’ll be writing about will include; twin parenting, tips and advice for new parents, cooking, healthy eating and healthy living, fun things to do with kids, money saving tips, time management, and pet parenting. I hope you will find my posts interesting, educational and fun to read. Please post any comments that you have. I would love to read them! There are a lot of other things I think you should know about me, but you’ll learn about them soon enough. 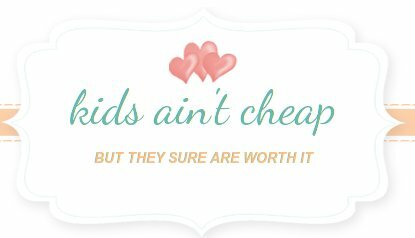 I am just so happy and grateful to be part of Kids Ain’t Cheap – it’s a great site with loads of potential!